You’re sitting in your doctor’s waiting room when the receptionist calls the name of the next patient. No one responds, she calls the name again, and prompted by curiosity, you look up from your magazine to meet her puzzled gaze. She repeats the name, this time adding the surname, and you wonder why she is calling your father. No, wait, Dad is long gone, and then you realize the receptionist is calling you. If you’ve ever had this happen to you, then, like me, you were given a name at birth that no one ever used. In my case, my parents named me after my father but never called me by that name. When I was old enough to handle the truth, they explained that they wanted to make sure no one in our small family of three would become confused about who was being addressed when my mother spoke. They used my middle name instead and it stuck. These things have a way of taking on a life of their own, so when my mother registered me in school, she registered me as Alan, once again so I would not become confused when my teachers called me by my father’s name. In my mother’s mind, confusion was evidently one of the great evils, second only to polio, that children must be protected from at all costs. It didn’t take a career in clinical psychology to teach me that she had this one right. Common sense alone would be enough to imagine the disorientation of a five-year-old on his first day of school in an unfamiliar setting with lots of other kids and an unfamiliar adult calling the shots – and the names. I grew easily into my short middle name – four letters and two of them are a’s. It doesn’t get any easier than that, and without a trace of confusion, I entered my teen years and got my first Social Security card when I started a summer job cutting the grass at the town park. In this, situation my first brush with government bureaucracy, I used the name I always used with no questions asked. The problem came later when more and more documents required my full legal name – first, middle, and last. Applications for college admission, financial aid, a driver’s license, new jobs, bank accounts, a marriage license, a mortgage, a professional license, health insurance, and tax forms all wanted to know that I carried my father’s name. So, I told them, except when I could get away with leaving it out or, better yet, signing with the first letter of his name followed by my middle name in the style of J. Paul Getty. With all of these documents to sign over a lifetime, it was getting hard to remember which version of my name I had used on which document. In spite of my mother’s best efforts to protect me from this scourge, I was becoming – dare I even write the dreaded word? – confused. There’s nothing like the enforcement branch of the Internal Revenue Service to snap a person out of confusion, and that’s just what happened when they came calling to find out why I had never paid my federal income taxes. Of course, the guy with my middle name on his Social Security card paid his, but the IRS didn’t know that because he filled out the form with his full legal name – first, middle, and last. I was at work when they came to the house to make the arrest, and it was only my wife’s quick thinking and photocopies of the disputed tax forms that saved my neck. It doesn’t take the IRS to tell us that our names are important. Our names connect us to our families, the people and values they hold dear, or to our ethnic, religious, or cultural heritage. They may reflect deeply held moral principles or nothing more than current trends in popular culture. Sometimes principles and culture meet as in Puritan New England where fashionable names included Prudence, Charity, Patience, Justice, and Temperance. Biblical names are still popular among certain religious groups, and movements of every kind generate their own lexicon of baby names. If you happen to be called Dharma, Rainbow, Hendrix, or Monterey, it’s a good bet your parents came of age and cherished the values of the sixties, or perhaps they just wanted you to stand out with a name that is unique. 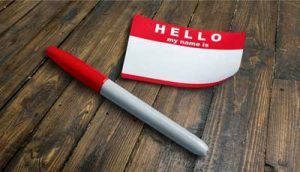 For some, originality is an important factor in choosing a name, and many parents just want a name that pairs well with their family name, something that sounds good together. Because our parents do the naming, our names at first reveal more about them than us. This changes over time as we crystallize our identities around the kernel of our names. Our likes and dislikes, talents, temperaments, and ways of relating to others – virtually all aspects of our personalities – come to be signified by our names. For those who know us well, our names become a shorthand for who we are, a way of grasping our essence or, to use the slang expression, our handles. For those who don’t know us at all, our names tell nothing about us, one James is the same as another, one Jill no different from all the others that we’ve never met. Now in my retirement years, I have a Medicare card in my father’s name and I am, yes, once again confused when I hear him called in the doctor’s waiting room. It makes no difference to the doctor whose head, shoulders, knees, or toes he examines, but it matters to me. My father would want it that way. He carried his name with dignity, and I can only hope I’m doing the same with mine.